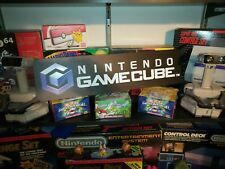 GIANT Toys R Us NINTENDO Logo 48" x 36" Display Sign/Box RARE. Condition is Used. Shipped with FedEx Ground or FedEx Home Delivery. This listing is for a reproduction Nintendo cabinet Marquee. I had the reproduction marquee Made from the exact specs of the original marquee. It is transparent so light will show through it. See pics for demonstration. It slides out from the sides so it will display horizontally or vertically. We do combine S/H when possible! Up for sale is a custom Nintendo sign made from birch wood. The sign has been hand sanded and smoothed. Has no spray coating of any kind. This is laser cut so it will have dark outer edges. Size is about 12” long so it a good display piece that does not take up much room. 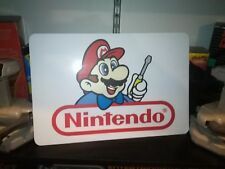 This Nintendo Logo sign is 15 years old. This was sent by the manufacture with these flaws. The trays are made of plastic and topped with faux velvet. They can be used as inserts for custom cases or can stand alone to display your collection. Each tray is 14 1/8" L x 7 5/8" W x 1/2" H.
S ign is made of a very thin, flexible. There is a blue peel off film on the backside. Once peeled, the backside of sign is silver. New condition! NOT VINYL.IT IS. See photos for details. There are minor scratches on banner from being displayed. Has been kept well in my personal collection for years. Nintendo Amiibo Display Castle - Ultra Fine Detail- Made In USA! Display your growing collection with pride! We use these for our office collection and love them. Custom item with fine details throughout - Extra Large sized! Countertop display standee for Super Mario Sunshine! Double sided, each side is shown! Even on the weekends, I should get back to you within a matter of hours. 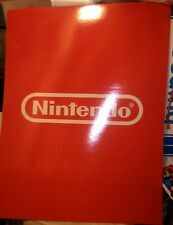 Nintendo Switch Display, Switch Aluminum Sign, 6"x24". Original World of Nintendo display push trays. Came straight from a World of Nintendo retail display case. Excellent condition and work perfectly to hold and display your NES, SNES, and more! Each one will be shipped in a cardboard box for protection. Pokemon HeartGold Video Game Promotional Retail Display Box with dimensions of 10.5 X 11.25 X 2.25 inches. Please look at all pictures before purchasing. The item was displayed at a retail store. It is not new. Please refer to pictures for slight creases and imperfections. There are other small imperfections not pictured but the front box art is in really good condition. 24 in long. Own this cool piece of Nintendo marketing!